My first thought as we were landing at Hewanorra International is my goodness this place is beautiful. This volcanic island's scenery is beyond what I could have possibly imagined. 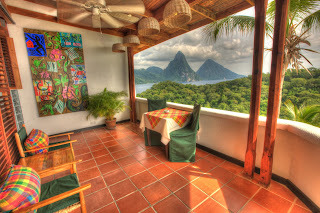 The twin peaks stood out right away and I was glad to hear that I would have a great view from where I would be staying - Anse Chastanet. As I am getting settled into my room I noticed a pleasant surprise; everything and I mean literally everything has been locally made or handcrafted. 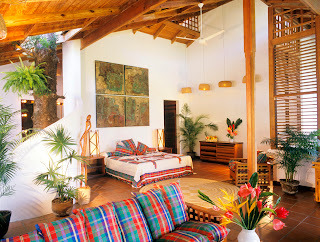 The bedspread and cushions are made from the national cloth called madras. The furniture was mahogany, red cedar, wild breadfruit and other local woods. It is always so great to see the use of local resources as so many resorts have seemed to escape their identity. St-Lucians are by nature a very polite, pleasant people. The staff at Anse Chastanet however are beyond polite. Every employee I encountered seemed to go beyond any expectation and cater to every need I could possibly desire. As if my surroundings of lush tropical settings weren't enough I had to get a massage at Kai Belte Spa to really reconnect with nature. 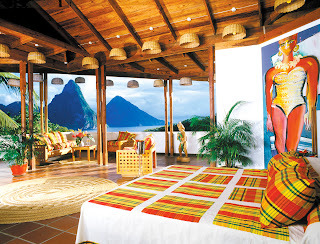 The new spa setting, Kai Mer is high on the hill right above the coral reefs of Anse Chastanet Bay. I decided on a swedish massage and could not feel more relaxed once it was over. Once relaxed and rejuvenated I thought I would try some activities. Anse Chastanet has so much to offer. From scuba diving to bird watching I can see why so many of the guests decide to return just to see the rest of the island as there are so many things to do right there on the resort. All in all I would have to recommend this resort to everyone and anyone due to the fact that not once did I have an unpleasant experience. Great weather, great people, great resort. 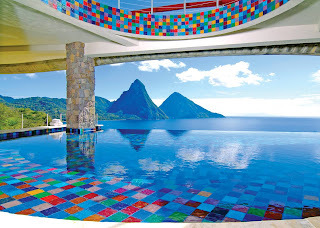 Discover St-Lucia at Anse Chastanet.